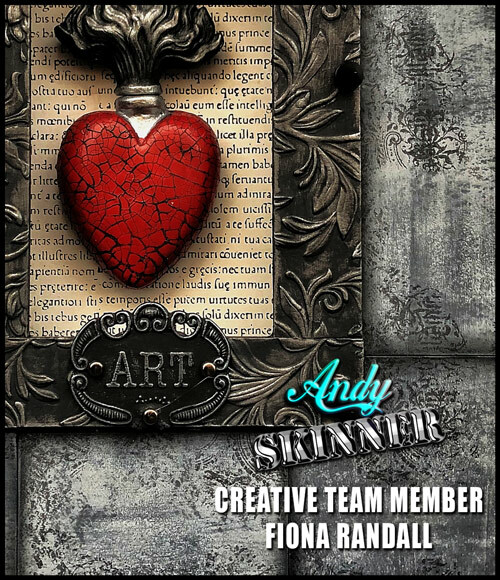 Morning all today I'm sharing my latest make using Andy's Industrial Box Frame Kit. I started by giving all the tiles for the frame a coat of DecoArt Chalky Finish in Relic. Next I applied DecoArt Chalky Finish in Yesteryear and before completely dry wiped back until I was happy with the look. I then stamped in Watering Can Archival Ink using my favourite Textures Stamp Set from Andy randomly over the tiles. I then Inked all the edges of the tiles to give them definition and glued them on to the box frame base. Next up, I embossed 300gsm cardstock and cut up into strips and attached to the small frame. The small frame was then given a coat of DecoArt Media Fluid Acrylic in Silver and when dry DecoArt Media Antiquing Cream in Carbon Black was applied and wiped back giving a vintage feel to the frame. A mix of DecoArt Media Fluid Acrylics in Pyrrole Red and Naphthol Red Light was applied to a resin heart. When dry DecoArt Media Crackle glaze was applied to form a lovely crackle appearance. DecoArt Media Antiquing cream in black was the applied and wiped back to highlight all the cracke. The same antiquing treatment used for the small frame was then applied to the resin flame that sits atop of the heart. DecoArt Media Black Gesso was then applied to a metal word plate and when dry DecoArt Metallic Lustre in Black shimmer was applied and buffed to a shiny finish. Finally text paper was applied to the backboard of the box frame. The resin heart and flames were then attached raised up by grey board offcuts to give a feel of depth and fixed in place to the back of the frame. The metal word plate and some black metal studs were then applied to the small frame and this was then attached on top of the tiles to finish. Andy Skinner Industrial Box Frame Tando Greyboard kit. 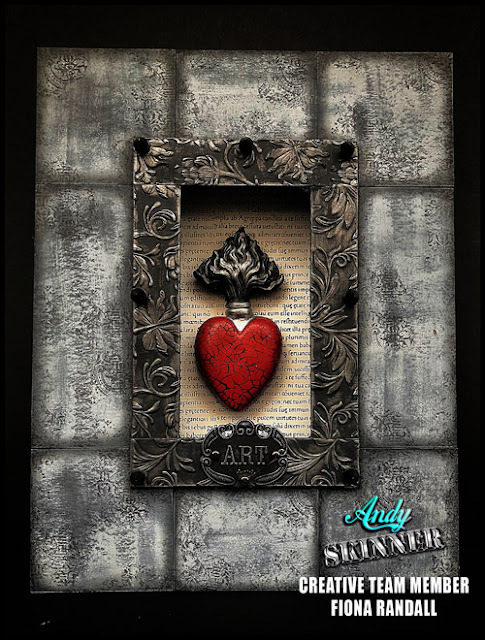 Andy Skinner Textures Stamp Set. Silver, Pyrrole Red, and Naphthole Red Light. DecoArt Metallic Lustre- Black Shimmer. Que labor más impresioante. Poco es más. Has conseguido que la mirada se vaya hacia el corazón.